Check out the Photo Gallery to see samples of our work, or Contact OTC for more information. On Track Creations is a fully insured, limited liability corporation, that secures all jobs through written contracts. 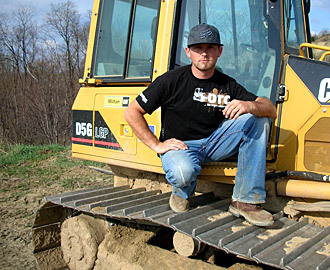 Owner/operator Jesse Milley has over 13 years of heavy equipment operating experience, and over 20 years of motocross racing experience. These two abilities are what brought Jesse’s dreams to fruition when he started his company in 2002. Alongside Jesse is his brother Matt, who followed in his footsteps and also started riding and racing at a very young age. Under the watchful eye of Jesse, he learned the ropes of operating heavy equipment to become an excellent track builder/operator. These two have shared a lifelong passion for motocross and it shows in their work. Along with motocross track construction, the company has an extensive background in site work/grading. Jesse grew up working on site jobs and road building projects after being accepted into the union for heavy equipment operators at the unusually young age of 18. In 2007, OTC started bidding on its own commercial site work and still does to this day. This is a distinct advantage that OTC has over their competitors. Our experience comes from a motocross and grading background. OTC knows how to build roads, run utilities, dig ponds, construct building pads, and has an extensive knowledge of drainage, which in every outdoor build is a major factor. Among our clientele are, the Cernics Kawasaki team, professional riders Paul Carpenter and Bob Kiniry, Millcreek Motocross Park, Lake Whitney Motocross Park, 2009/10 Fly Racing Stadium Cross. On Track Creations is looking to build long term relationships, and provide a service you can depend on.